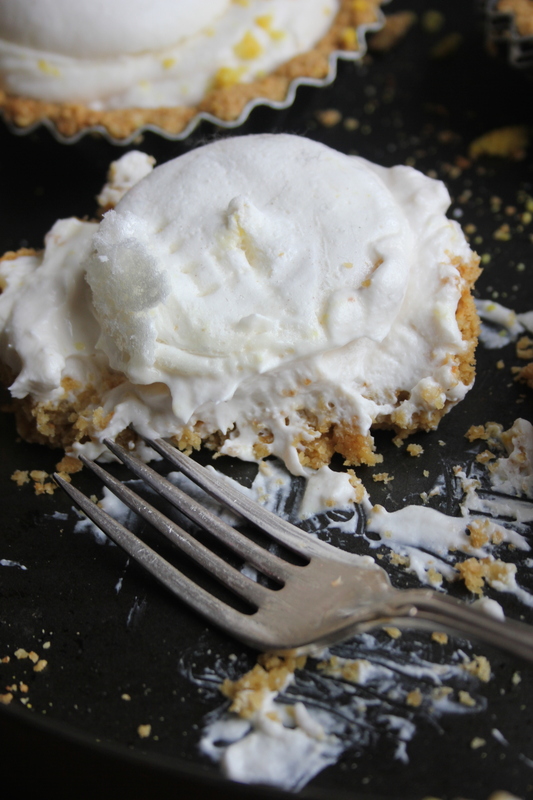 So the internet pretty much exploded last week because someone invented vegan meringue. And of course within 24 hours every vegan on Instagram was posting photos of their own creations. I wasn’t going to get left behind! 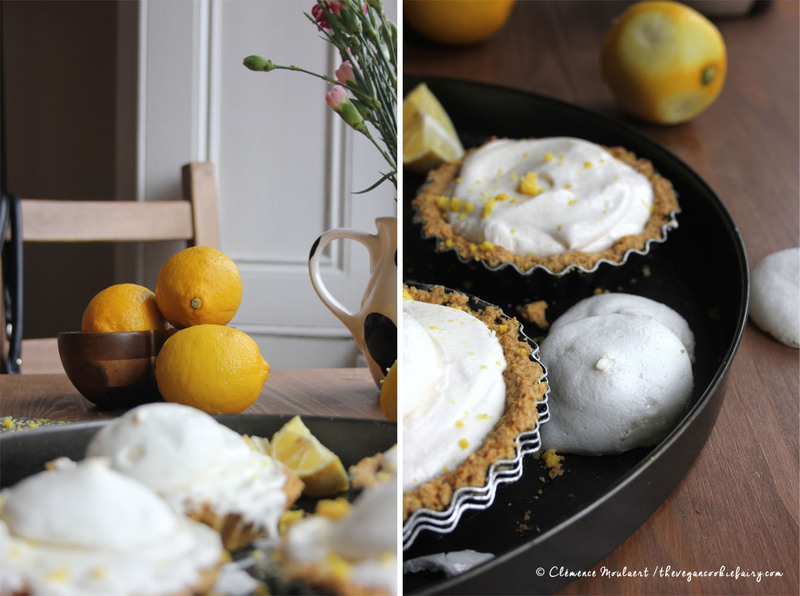 This recipe is a really exciting one because it’s a classic that I have wanted to try for ever but never could because everyone thought vegan meringues were impossible. Well NO MORE! I heard wind of this vegan meringue via @SomerMcCowan from Vedged Out on Instagram, then @FloralFrosting was at it too (and is now making macarons in all colours of the rainbow). Apparently the recipe is originally by Good Wohlt and was posted on the Facebook group called What Fat Vegans Eat. So, how to make vegan meringues. You will need two things: caster (granulated) sugar and chickpea brine. Yes, chickpea brine. As in, the yucky water that comes out of a can of chickpeas when you empty it. Save the chickpeas for a yummy salad or to make some hummus and keep the water, whisk it into submission like you would egg whites, and I swear it’s like witchcraft, the brine actually foams up. At this point you throw in the sugar and keep on beating until you obtain stiff peaks. I’m not a scientist so I’m not sure why or how it works, I just need to know that it does. Does other bean brine work? I accidentally picked up a tin of butter beans instead of chickpeas (who IS this person who keeps putting the wrong tins in the wrong places?! I bet it’s the same person who put a container of sour cream amidst the hummus and ruined my lunch one time) and it didn’t work so well: the brine just didn’t turn into stiff peaks. However, I have read about people using kidney beans and other types of beans with great success and no unpleasant colouring of their meringues. Now this isn’t like most meringue pies. 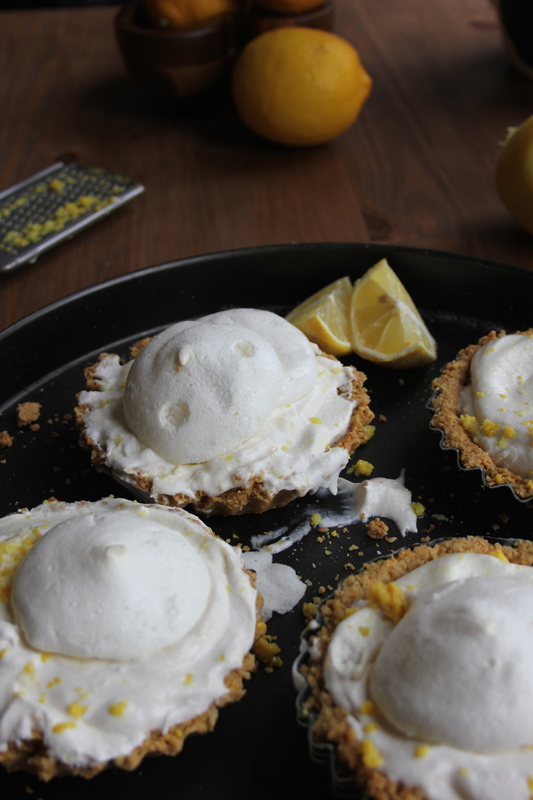 The coconut cream mixed with lemon juice actually has a texture almost like coconut yogurt, which I find quite pleasant; the contrast between the creamy coconut and the zingy lemon is divine, but it’s obviously not like a proper lemon meringue pie. I baked the meringues separately and then put them on top of the cream filling. But hey, it’s super good, so give it a go! 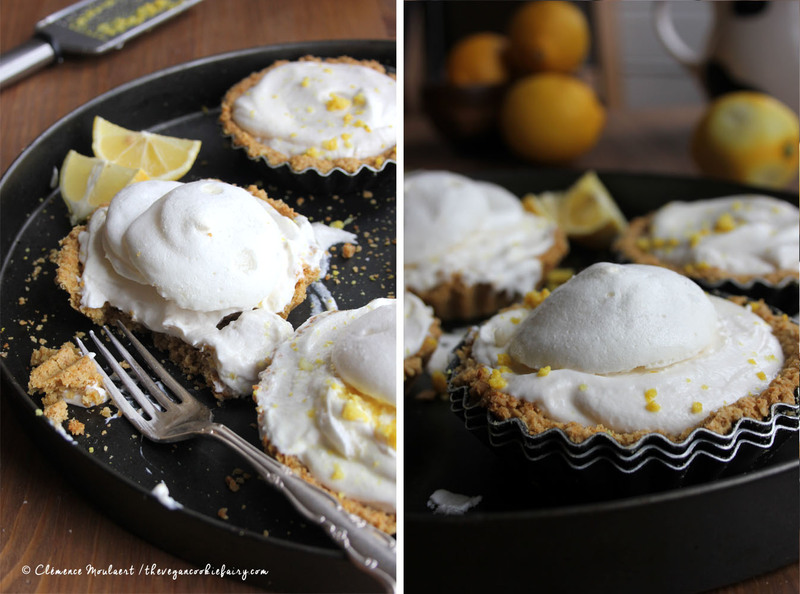 These pies are super adorable, easy to make, gluten-free, vegan, uber creamy, decadent and irresistible. 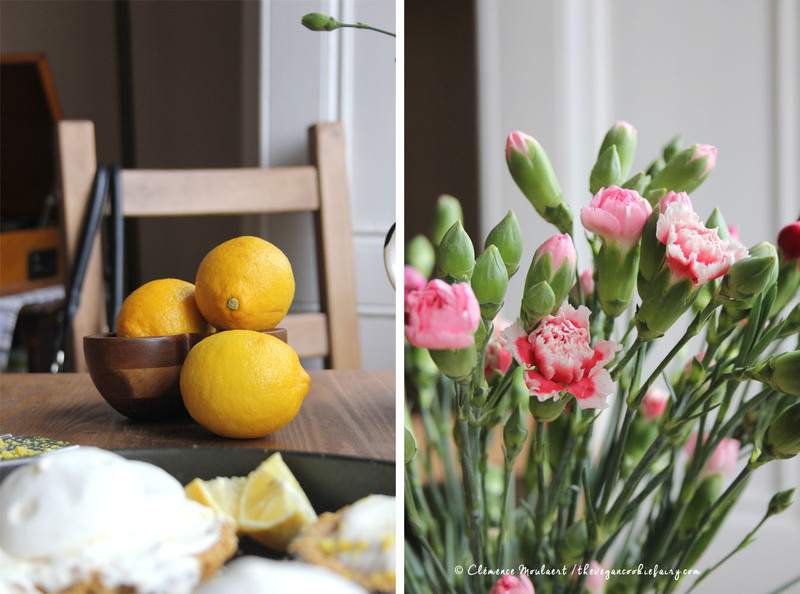 They make me feel all spring-like and excited (and surprise surprise, it’s not a chocolate dessert for once!). They’d be perfect for an Easter dinner party if you’re having one this year. Plus they’re kind of messy, and I think messy desserts are the best. I made these into individual portion sizes but some may think they’re big (depending on your appetite) so you could split each tartlet between two people. OMG, looks good and that picture with Mali is WOW…. This is indeed very revolutionary! Waw even! More healthy too! 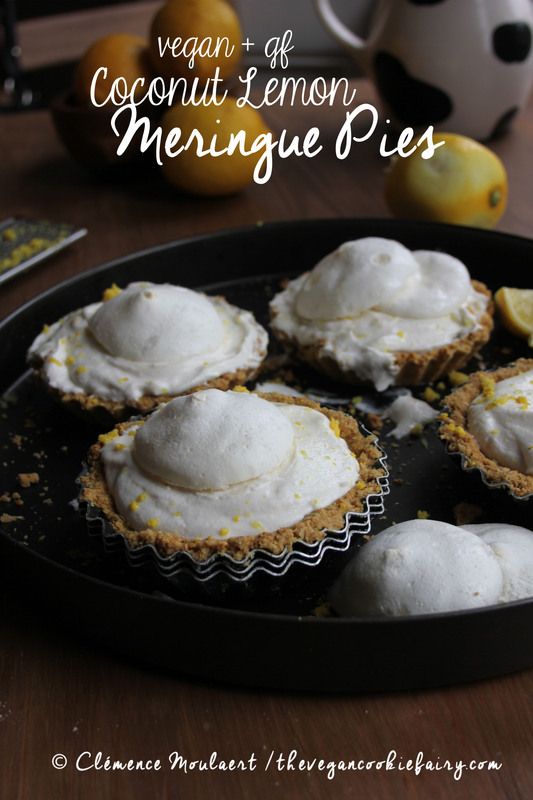 Your meringue tartlets look fabulous, my friend! 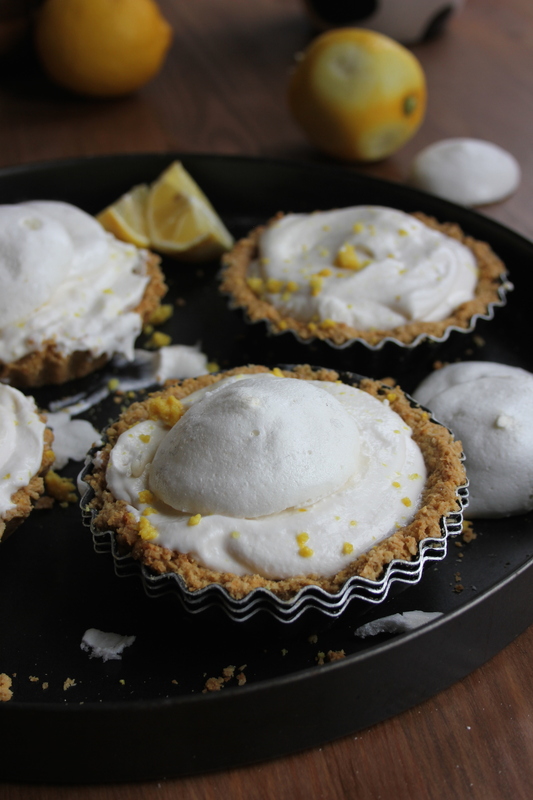 I’m so intrigued by this vegan meringue… Chickpea brine? Really? Sounds ridiculous but exciting at the same time! I have tried using ground flaxseed to make a meringue as the recipe and pictures convinced me but it didn’t work, I shouldn’t have got so excited. This is definitely something I want to try at home over Easter and if it works for me I am going to be amazed…. I love your idea for meringue! I will definitely try this out. 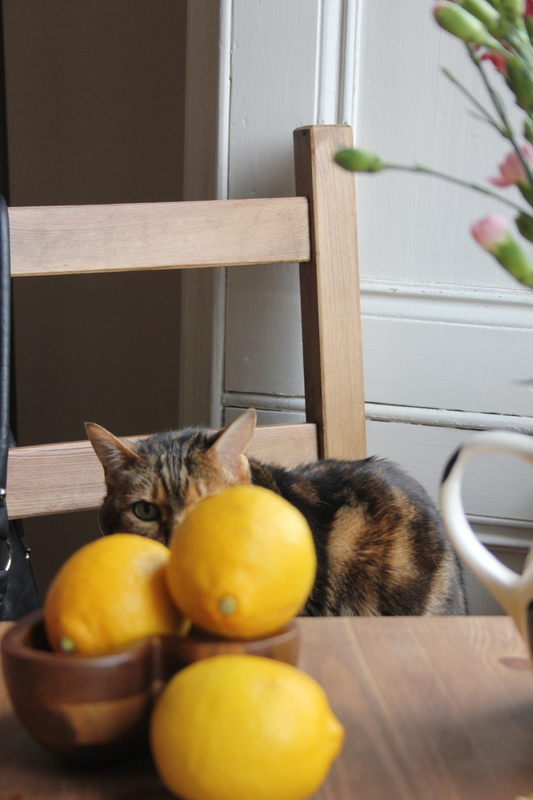 Typo alert: I notice you said 350 ml or 1/3 cup + 1 tbsp coconut cream …. I think you mean 1 1/3 cup!! Woopsie, thanks for the heads up. I’ll go fix that! For the coconut cream, did you use what rose to the top of canned coconut or did you use cream of coconut…I always get confused! It’s the top of a COLD can of full-fat coconut milk 🙂 In the UK you can buy small cartons of coconut cream from the brand Blue Dragon in large Sainsbury’s supermarkets (which is what I use so I don’t have to pay for the whole can of coconut milk and waste the coconut water). Has anyone tried this in a big tart pan? Will it work out? Hi thanks – I will make these tomorrow! I couldn’t see the oven temperature for cooking the pie bases – is it 180 degrees?